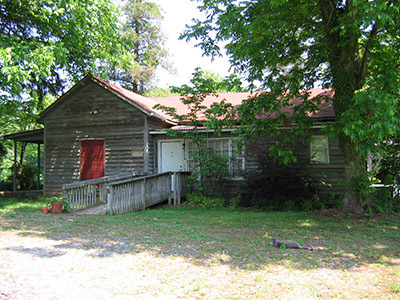 The original “Old House” building was built as a private residence by William Lenoir Smith (who was a soldier in the North Carolina 23rd Infantry- CSA during the Civil War) and his wife, Katherine D. Smith, in 1873. The building sat on several hundred acres of property that still remains in the family in Gaston County, North Carolina. For nearly one hundred years, the building was primarily surrounded by little more than farmland. Evan raised several children, including a son born in 1930 named Elmer D. Brandon. 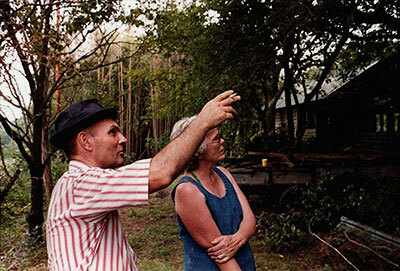 (Elmer hated the name “Elmer” and went by the name “Dee.”) After his parents moved to a larger house on nearby Clover Road, Dee took up residence in the house and lived there until the late 1970s. Dee and his family then moved to another nearby residence, and although most of the family still remains in the same area, the original house sat vacant for nearly twenty years. In 1993 Dee’s daughter, Janet, married Gastonia native, musician, and recording enthusiast David Black. David had spent much of his youth touring with various bands as a drummer and live sound mixer before returning to Gastonia and getting work as an electrical systems engineer. One day, while tending to the family property, David got what he called “a vision” of turning the long-unused building into a functional recording studio. With permission from the Brandon family to renovate the old homestead, David enlisted fellow musician Scott Applegate to assist in the interior design and construction of the studio. After two and a half years disassembling two brick fireplaces, re-roofing, installing new windows, putting up double-walls, installing floating floors, and designing new electrical, plumbing, and climate-control systems, Old House Studio was complete and open for business in September of 1998. With a unique combination of personality, talent, and dedication, David quickly found a niche in the local recording community and won over many acts, including Gastonia native singer/songwriter Sammy Johns, whose 1975 hit “Chevy Van” garnered him national attention. In 1999, the comfort of the studio led to a full-time venture for David. Before long, Old House had become a favored location for nearby freelance recording engineers and producers, as well. In December 1999, Mix Magazine featured Old House in its Project Studio column. As an avid gear enthusiast with an eagerness to learn, David made sure that the studio’s equipment collection grew almost as fast as his engineering skills and the studio continued to thrive in the old Gaston County farmhouse. In April of 2005, after a series of unfortunate health problems, David Black passed away at the age of 49. While trying to maintain projects mid-stream, Janet Black and Scott Applegate enlisted the help of freelance engineer Chris Garges. With the blessing of family and friends, Old House Studio continued to thrive and grow under the management of Garges and Applegate, with Garges serving as the chief engineer. In June of 2008, Old House Studio celebrated a major milestone in any studio’s history– a mixing console upgrade. In September of that year, the studio celebrated another milestone– its tenth anniversary. Janet Black eventually decided that she needed to move beyond the stage in her life where the recording studio evolved, so Garges made arrangements to purchase the Old House Studio business and its assets and move into another location. Since most of the studio’s clientele were from Charlotte, Charlotte seemed like a logical place to move. As luck would have it, one particular studio owner in Charlotte was considering retirement and discussions began about Garges taking over his space and turning it into the new Old House location. Plans were made and equipment was temporarily moved into storage, a good deal of which spent nine months at The Playroom rehearsal facility, coddled together into a makeshift control room where Garges actually mixed several commercial releases during the Old House interim (studio designer Joshua Morris dubbed the temporary control room “On-Hold House”). Just when everything was starting to look good for the move into the new Old House location, the deal went south. Garges had to find a new location… QUICKLY. Finding a proper location in which to build an ideal recording studio is an extremely difficult task and near-impossible to do on a fast-track time frame. Two days after the deal folded, Garges drove into a business park near downtown Charlotte on a whim. There were two units available. Two days later, in January of 2013, after a particularly disheartening meeting with a real estate agent about another potential spot, Garges called about the available business park units. Assuming he was looking for office space, the units’ owner told Garges that one would be ideal for an office-type environment, as it had eight offices already built-out. The other would require upfit, as it had initially been built as a recording studio. While the Pendulum Studio location had not been in operation as a studio for several years, much of the original structure was still intact. An agreement was made and Garges began four months of construction, including general renovations and improvements, construction of a new isolation booth, wiring, window installation, equipment moving, acoustic design and treatment, new HVAC systems, painting, drywall, and lots and lots of dust. Studio designer Joshua Morris (who works at Walters-Storyk Design Group in NY), along with woodworking expert Bob Barone, HVAC expert Robert Hildreth, construction/electrical/plumbing whiz Charles Blaney and super-helper Carly Blaney, construction pro Josh Burgess, the framing and drywall team of Venture II Construction, equipment fixer/problem solver Robert Preston (of RFI Audio), solderer Mark Eckert, console movers Brandon Nater, Colby Dobbs, John Elderkin, Josh Daniel, and Dan Hood, intensive labor savior John Shaughnessey, and the fantastic Carrie Garges all helped bring the new Old House Studio to life. 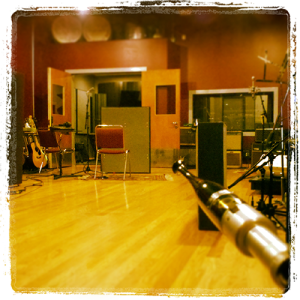 On May 10th, 2013, Old House Studio had its first full session in its new Charlotte location. In September of that year, they celebrated their 15th year in business. On March 3rd of 2017, Garges purchased the space in which Old House Studio is currently located, further insuring the longevity of the studio’s ability to serve the artistic community from its Charlotte, NC location. In September of 2018, Old House Studio will celebrate its 20th year in business! Old House remains a fun place for interesting people to gather and create. In the grand tradition of unique characters who’ve inhabited the original ” old house” at one time or another, we think William Lenoir Smith would be proud.